Happy fall semester! 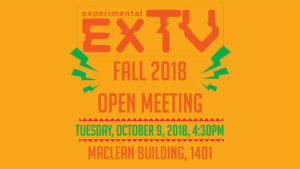 If you’re interested in ways to put your work up publicly or submitting to future events, come to our open meeting at MacLean 1401 (right next to the lounge and elevators) to meet the team that makes that happen and find out new opportunities to share your video art. You can ask us all the questions you’ve been wondering about, including how to submit and how to create your own ways to connect with the FVNMA community at SAIC. You’ll get to see the behind-the-scenes of how we plan our programs and upcoming events, including ExFEST and our 20th-anniversary screening. Though ExTV is a student-run organization and NOT a student group, we’re still looking for a new member to join us on the team! We are also now hiring a new production assistant to join our team! This job opening can be found at SAIC Launch for more details and information. Pizza (with vegetarian + gluten free options) and snacks will be served. To RSVP to the open meeting on Facebook, click here.